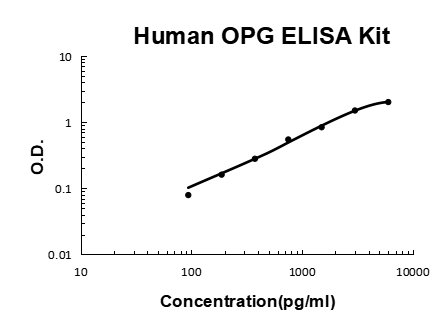 Sandwich High Sensitivity ELISA kit for Quantitative Detection of Human OPG. 96wells/kit, with removable strips. Highly expressed in adult lung, heart, kidney, liver, spleen, thymus, prostate, ovary, small intestine, thyroid, lymph node, trachea, adrenal gland, testis, and bone marrow. Detected at very low levels in brain, placenta and skeletal muscle. Highly expressed in fetal kidney, liver and lung.